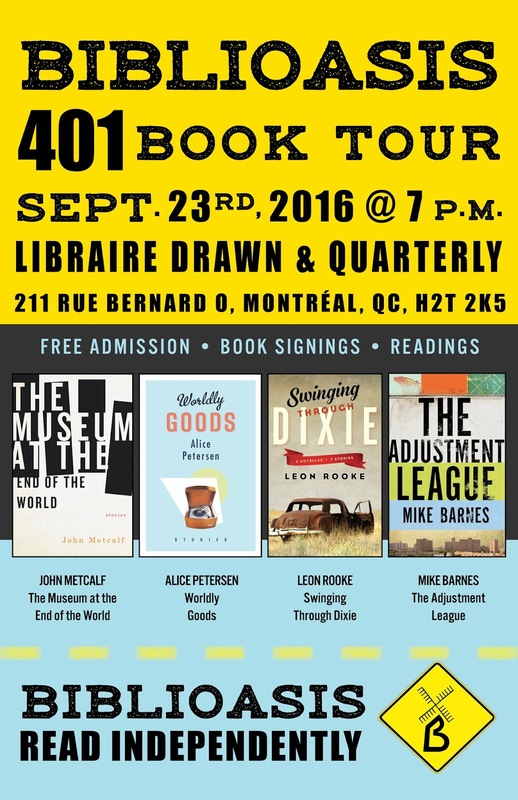 Join us on Friday, September 23rd for the launch of four new Biblioasis books by four excellent authors. Come stop by! Admission is free, and wine will be served. Legendary Canadian writer and editor John Metcalf is back, in full comic force, with a linked collection of stories and novellas. Set in Nashville, Memphis, New Orleans, and Ottawa, these tales span the life of writer Robert Forde and his wife Sheila. Playing with various forms of comedy throughout, Metcalf paints a portrait of 20th century literary life with levity, satire, and unsuspecting moments of emotional depth. John Metcalf is the author of more than a dozen works of fiction and non-fiction. He lives in Ottawa, Ontario. Hailed as being both assured and stylistically confident, Wordly Goods reveals through a variety of stories that ownership is more than possession. In her new collection, Alice Petersen shows how small objects stand as markers of our attempts to communicate with each other. Originally from New Zealand, Alice Peterson has spent the last two decades living in Canada. Her works have been shortlisted for the CBC Awards, and have appeared in the Journey Prize Anthology and Best Canadian Stories. The two novellas and three short stories in this new collection by Governor General’s Award winner Leon Rooke are united by place and mood. Told in the style of Jose Saramago or Garcia Marquez, daring young women, mad mothers, and traumatized children are affected radically by the magic of their world. Leon Rooke is a novelist, short story writer, editor, and critic. He has published 28 books, nearly 300 short stories, and is the recipient of the North Caroline Award for Literature. Prompted by a mysterious summons from his past, a man known only as “The Super” begins an investigation into maternal neglect by a privileged Toronto family. As the case deepens, revealing a web of systemic crime and depravity, The Super undertakes a series of adjustments: his word for the personal interventions that he conducts on behalf of the powerless. These increasingly chaotic retributions soon pull him into a spiral of brutal violence.